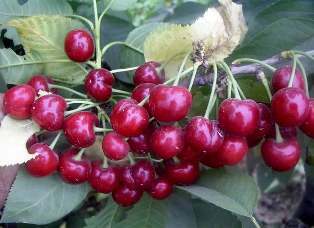 Cherry (Prunus avium) is confined to Kashmir, Himachal Pradesh and hills of Uttar Pradesh in India. A delicious fruit, cherry is rich in protein, sugars and minerals. It has more calorific value than apple. Due to higher return, cherry is gaining popularity in temperate regions of the country. Sweet cherry requires colder climate. It is grown sucessfuflly in areas between 2,000 and 2,700m above sea-level, requiring 1,000-1,500hr chilling period during winters. Climate of Jammu and Kashmir, high hills of Himachal Pradesh and Uttar Pradesh is ideal for its commercial cultivation. 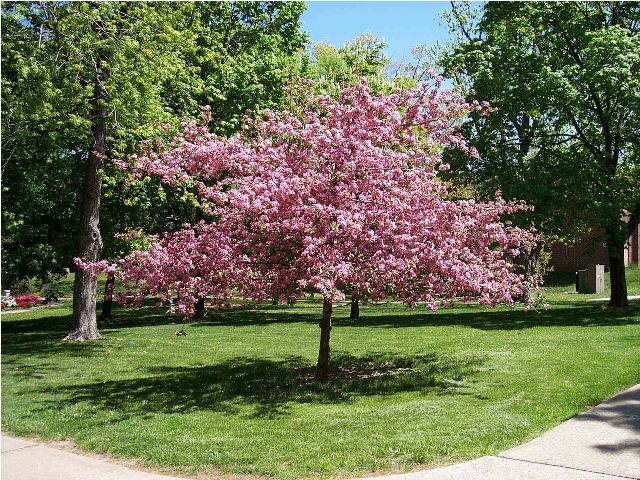 Cherry blossom is very sensitive to spring frost; therefore frost-free sites of hill slope and valley areas with and outlet for the cold air are preferred. Since southern and south –western aspects are warmer, they should not be selected at lower elevations. Generally, north-eastern aspects are most suitable for cherry cultivation. An annual rainfall of 100-120 cm, well-distributed throughout the year us desirable but high rainfall during flowering results in heavy blossom wilt. At the time of fruit ripening heavy rains causes fruit cracking. Therefore, it should be dry at the time of fruit ripening. A well-drained deep sandy loam soil with pH 6.5-7.0, which can hold, moisture during summer are most suitable. 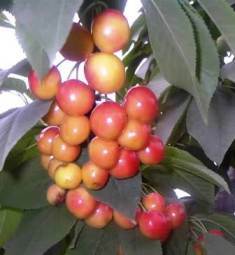 The cherry plant is very sensitive to water logging, so heavy soil should be avoided. Fruit is heart-shaped having soft and tender flesh. Colour of fruit varies from dark with reddish juice to light coloured with coloured with colourless juice. Stella and hybrid (13-17-40) are new promising varieties. Recommended varieties suitable for different states are given in Table 1. Cherry is propagated by grafting on seedling as clonal rootstocks. Details are given below. Seedling of paja (Prunus cerasoides var. majestic), bird cherry (Prunus paddum), mahaleb and mazzard are used for raising sweet cherry plants in India. Seeds of paja do not require chilling treatment to break dormancy but seeds of mahaleb and mazzard require stratification before sowing. Seeds are extracted from fully ripe fruits. They are dried and stored in a cool place. Seeds are soaked in 500 ppm GA3 for about 24hr, then they are stratified by placing between the layers of sand in a cool place at 2*-4*C for 80-120 days for mahaleb and 120-50 days for mazzard to break seed dormancy. During stratification, the medium is kept moist. As the embryonic root comes out from seed coat, these are transplanted 6cm deep and 10-15 cm apart in rows spaced at 20-25 cm in nursery beds. The nursery beds are mulched with 10-15 cm thick hay and irrigated lightly. Mulch material is removed when seedlings attain 5-6 cm height. The nursery should be watered twice a week and weed-free. In Himachal Pradesh, Colt and Mazzard F 12/1 clonal rootstocks are commercially recommended for raising its plants as trees on pala show symptoms of delayed incompatibility. 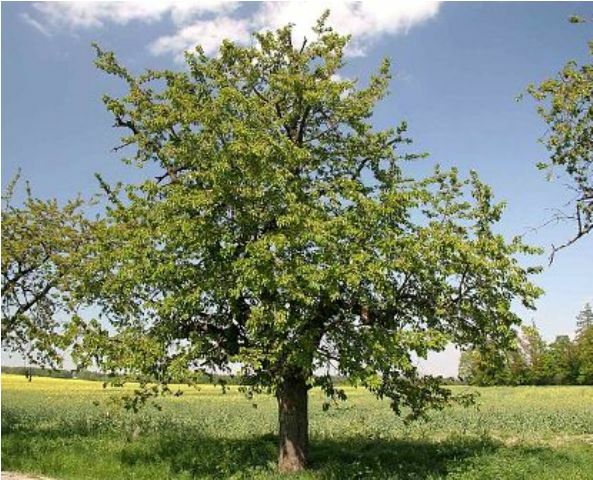 Colt is semi-dwarf, compatible with almost all varieties of sweet cherry, has good anchorage, and is resistant to gummosis, crown-rot, moderately resistant to stem-pitting virus and bacterial canker but susceptible to oak-root fungus. Mazzard F 12/1 is semi-vigorous and difficult-to root. Mound or stool layering is the common method of clonal rootstock multiplication. The stool beds are established during December by planting healthy mother plants 30-45 cm apart in row spaced at 60-70 cm. Before new growth starts, the mother plants are cut back to 2.5 cm above the ground level. New shoots develop on the stub in the spring. When the shoots are 25-30 cm long, their bases are covered with a mound of soil or saw-dust, building the mound to a height of 20-25 cm as the shoots grow during spring. The suckers are ringed at the base and then covered with soil to encourage rooting. In difficult-to-root Mazzard F12/1 root stock, IBA (7,500 ppm) is applied to the ringed portion of the shoots during summer. The shoots are separated in winter and then lined out in the nursery beds. If the suckers are well-rooted and more than .8 cm in diameter, they are grafted in the spring, otherwise they are kept in the bed for a year to produce strong plants for grafting. Colt rootstock is easy-to-root and can be multiplied through cuttings. Hardwood cuttings of 30-45 cm length and of pencil thickness are taken in February. Cuttings are treated with IBA (2,550ppm) for 10 seconds and planted in nursery beds for rooting. Rooted cuttings are lined out in December and grafted with scion variety in March. Cherry plants are propagated mainly through grafting. Tongue grafting during February-March is recommended, which gives a bud-take of more than 90%. For grafting, the scion wood is collected during winter when the buds are dormant. Scion wood is packed in moss grass and then wrapped in moist gunny bags. These packed bundles of scion wood are stored at 2-4 C till these are used for grafting. In India, cherry cultivation is confined to hilly areas on sloppy lands. The planting is done on contour or terrace system. However in valley areas, square system of layout is recommended for the establishment of an orchard. The planting distance depends upon the soil fertility and the rootstock used. A spacing of 6m x 6m is recommended for plants raised on seedling rootstock in Himachal Pradesh. Pits of 1m x 1m x 1m size are dug and filled with a mixture of 35-40 kg farmyard manure and half kg super phosphate one month before planting. The pits are filled at last up to 15 cm above the ground level. December-January is the planting time. Since most of the cherry varieties are self-sterile, they need cross-pollination. There are many cross-incompatible groups and the varieties within a group should not be planted together without a pollenizer. Pollination problem in sweet cherry is very complex because most of the varieties are not only totally incompatible with their own pollen, but also with the pollen of some other varieties. Care should be taken to see that not only their flowering period overlaps, but they also do not have the some sterility alleles. The varieties which have the same sterility alleles if planted together will not set fruit and require at least one other variety having different sterility allele for better fruit set. The universal donor varieties-Stella, Vista, Vic, Seneca and Vega-can be planted with any variety to get good fruit set provided their flowering period overlaps. Besides, 2-3 be hives/ha are recommended in a cherry orchard for better pollination and fruit set. Cherry trees are trained on, modified leader system. Plants are headed back at about 60-80 cm at the time of planting. The central leader is retained and 3-5 wide-angled branches, 20-25 cm apart spirally around the tree are selected in first dormant pruning. The lowest branch should be 40-60 cm above the ground level. The selected scaffold branches are headed back to minimum and only one-fourth of the growth is pruned off. In second dormant pruning, 3-4 well-spaced main branches are selected whose one-fourth growth is pruned off and on each main scaffold well-spaced 3-4 secondary branches are selected. After 3-4 years, central leader is headed back and lateral branches are allowed to grow, resulting in the development of strong and moderately spreading tree. Cherry plants require more corrective pruning rather than too much heading back of the branches. Bearing trees need some pruning to keep the centre of the tree open. The top is kept fairly low, to generate new growth. Pruning is restricted to eliminating the dead, diseased and intercrossing branches. Fruits are borne laterally on spurs of one-year-old shoot. The average productive life of these spurs is 1-12 years, requiring less super renewal pruning. Cherry requires all the essential nutrients for better growth and quality fruits. Since fruit development and vegetative growth occurs simultaneously, it has high demand for mineral nutrients. The amount of manure and fertilizer to be applied is influenced by the age or size of tree, soil types and fertility, cultural practices and anticipated fruit yield. The Manuring schedule recommended for sweet cherry in Himachal Pradesh is given in Table 4. Farmyard manure should be applied in December along with a full dose of super phosphate and muriate of potash. Half dose of N is applied in spring before flowering and the other half dose of N is applied in spring before flowering and the other half one month later. Fertilizers are broadcast in tree basin about 30 cm away from the tree trunk. Cherry orchards are maintained under permanent sod with a clean basin management. The basins are kept clean by hand-weeding or using weedicides. Application of Diuron 4kg/ha as pre-emergence and Paraquat (0.5%) as post-emergence are recommended to suppress the growth of weeds for 4-5 months. Mulching tree basin in April with 10-15 cm thick hay also helps control weeds and conserves soil moisture. Green manuring crops-bean, pea, red clover and white clover-can also are grown in tree basins to improve soil texture and fertility. Due to sloppy lands and non-availability of irrigation water, cherry is grown under rain fed conditions in our country. The distribution of rainfall throughout the year is uneven and owing to less rainfall during April-May, its plants should be watered frequently. Irrigating its trees at weekly intervals during fruit growth and development is recommended for better fruit size and quality. The yield and quality of cherry is appreciably affected by the stage of maturity at which fruits are harvested. Early-picking results in flat fruits with les yield as cherries usually develop rapidly in the last few days before maturity is reached. Harvesting of over-ripe fruits results in loss of weight, volume and quality. Determination of degree of maturity should be employed as a guide for harvesting of fruits. Colour development, TSS and flavour are the best standards for judging the optimum time of harvesting. Fresh fruits are picked with stem when the surface colour changes from green to red. While for processing, fruits are picked without stem. The average yield is 15-20 kg/tree. The fruits are packed in boxes lined with paper. Generally, 5kg boxes are used for packing.